Unfortunately we were blown out yesterday due to a small craft advisory warning, but we were back at it today. We focused on targeting a bluefin tuna today since there have been a few hooked up each day here in VA Beach. The tuna have been weighing in around 200 lbs, so we wanted to see if we could be one of the lucky few to get the bite. We left the dock at 7:20 am with light East wind and partly cloudy skies. There was a fleet of boats around Cape Henry so we decided to stop and try for a striper for an hour. There was plenty of bait, but no bites. We picked up and ran out towards the Light Tower right around where we stopped on Wednesday and caught our fish. 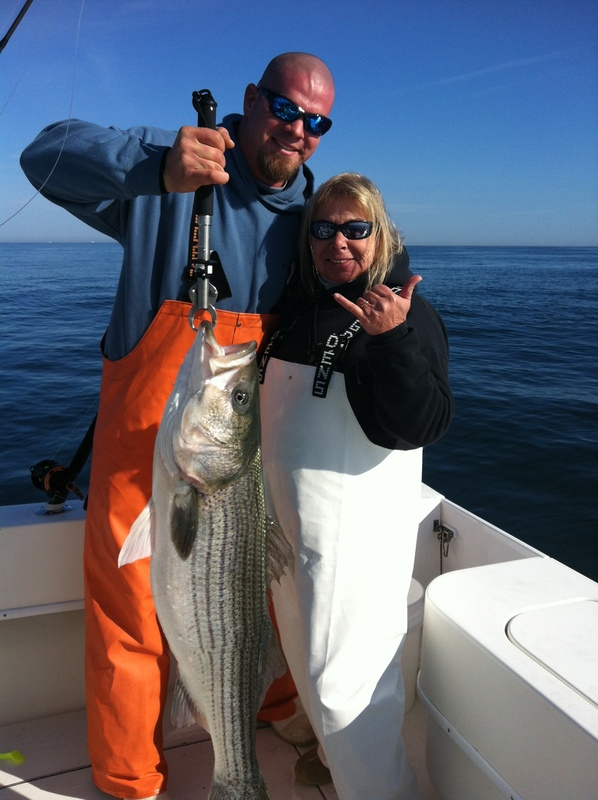 The birds, bait and stripers were there again and we caught 7 stripers pretty fast trolling Mojos at 4.5 knots. The stripers were aggressive, and were eating mostly chartreuse until the sun went behing the clouds, then the majority of our bites came on white. We kept pounding it out hoping for a bluefin tuna bite. A boat near us ended up hooking up into a bluefin, but broke it off after and hour and a half. 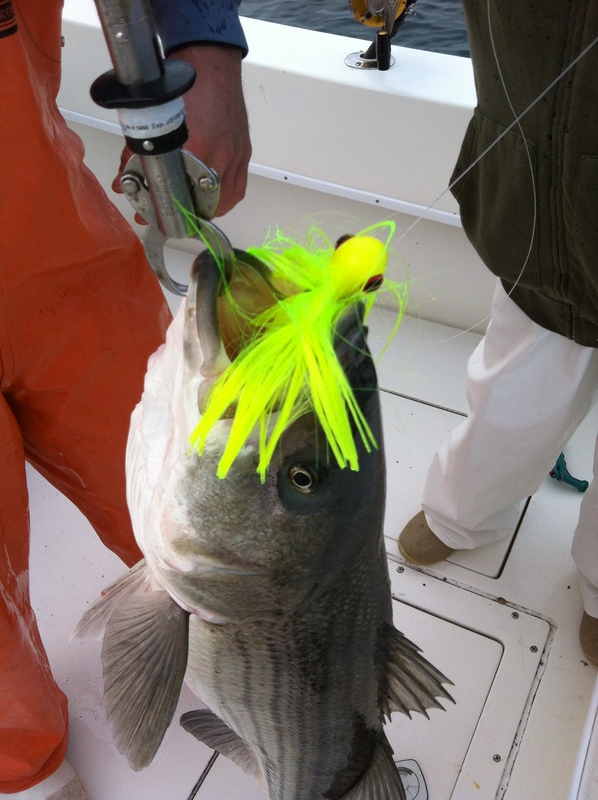 We keep getting bit by stripers, and the sounder was lit up with bunker and striped bass all day as the birds kept telling us where the stripers were all day. 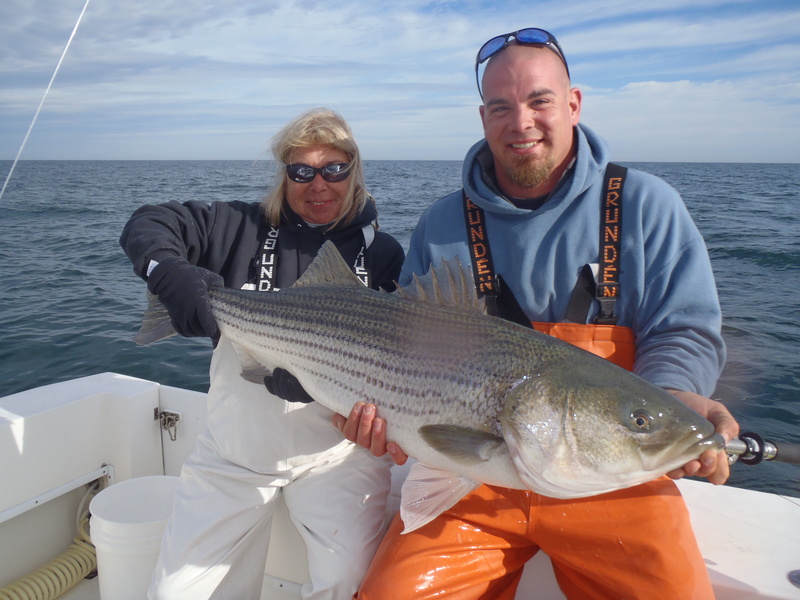 We ended up catching and releasing 27 stripers, 2 of which weighed in at over 42 lbs on the Boga Grip. We had a blast, but unfortunately we didn’t get our tuna bite. 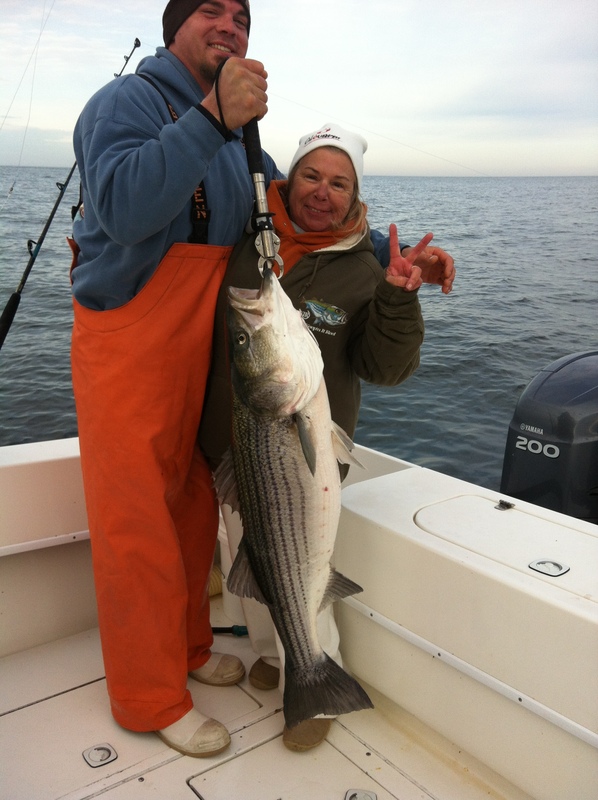 We did hear that some boats found stripers inside of 3 miles for the first time in weeks. We will be putting the Trade In back on the trailer and dropping her off in NC tomorrow, then back to NJ tomorrow night. Overall, we had a great trip, and we were stoked we came down to VA Beach to do some fishing. Today we made a change of plans and decided to go try for sea bass. We got a little bit of information to start with and went from there. The weather was perfect at calm, sunny, and 60 degrees to make a 30 plus mile run, so we took advantage and ran out to the Triangle Reef. I grabbed some wreck coordinates off of the internet and decided we could make it happen out there. The water temperature was 47 degrees, and the water was very clean. We tried a few wrecks with no real success. Just a few small ones here and there on diamond jigs. We moved around a bit and finally found a better concentration of sea bass that we kept picking through. The throwback to keeper ratio was horrible at about 8:1. They started to eat squid on the top and bottom rigs and at about 1:00 pm we found a major concentration of sea bass and it was nonstop drop an reel fishing. Double headers on every drop, and the throwback to keeper ratio improved to 4:1 so we were able to put our limit into the box. Once we had our limit, we packed up and headed back inside around the Tower where I marked bait on the way out. We got there in no time since we could run 35 knots without a problem, and we put out the Mojo Jigs and heavier tackle for bluefin tuna. We had great bait marks, and I was positive I marked at least one tuna, but we couldn’t get a bite. Trolling at 4.5 knots, we still had some stripers inhale the Mojo Jigs with the 9″ shad bodies and we wound up catching 4 nice stripers up to 28 lbs in the last hour and a half. We also saw humpback whales fully breaching out of the water while we were inside which was an awesome sight to see! We marked a ton of bait and a lot of striped bass on the sounder while we were there, but no bluefin tuna bites. Another fun day on the Trade In. We made our way out of Lynnhaven this morning around 7:30 am with a thick frost on the boat. It was definitely a frigid morning. We ran past the line of demarcation in the Chesapeake Bay and put the lines in to start trolling for striped bass (aka rockfish here in the South). It was slow for the first couple hours, then we saw over a thousand gannets in the sky just offshore so we ran out to take a look. They dove here and there, and we had some bait marks, but our Ava Jigs only produced a few spiny dogfish. We heard of a few bluefin caught offshore at the Chesapeake Bay Tower so we decided to see if we could get lucky and find one mid day. We had a few whales feeding on krill around us, and we worked the area hard for a few hours as we heard of nothing else going on. This got us a 35 pound striper and a 25 pound striper, both of which were caught a released on Mojo Jigs with 9″ shad bodies pulled just off of the bottom. We pounded it out a little longer, then ran back inside hoping to find a striper in legal territory, but no luck as it was completely vacant of bait and fish. Not an awful start to the week, but it is definitely making us rethink strategy as I am not confident we will pick up the fish we need inside the 3 mile line in 46 degree water. We are trailering the Trade In down to Virginia Beach in search of stripers and maybe a bluefin. 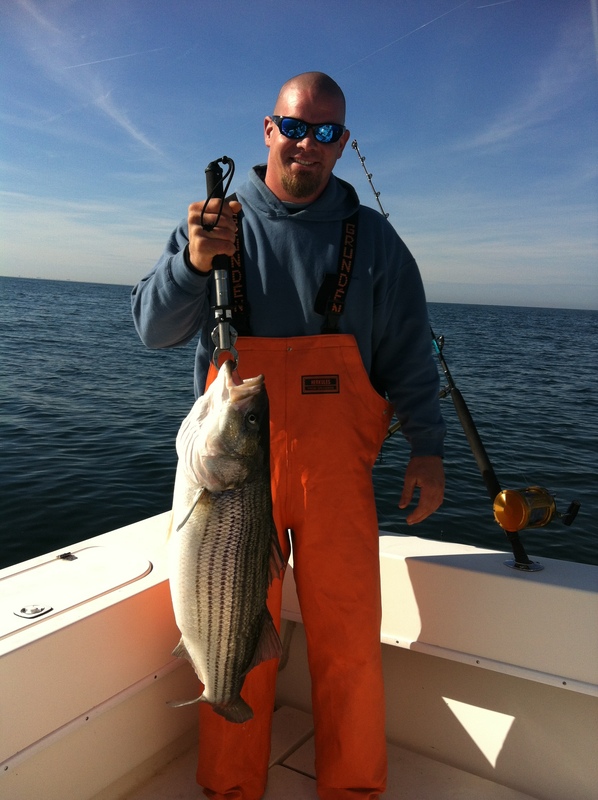 We will be targeting stripers all week with 16# test. Maureen needs a 48.5 pounder to break the record on 16# test line. The wind is blowing hard today, so hopefully the stripers find their way back inside the 3 mile line. It doesn’t sound like there was much action at all this past weekend, so hopefully we will have better reports to post up this week.